LynchyRightNow: End of an era . . .
End of an era . . . It's hard to argue with the recent success of Joe Dumars and the Detroit Pistons. Since the 2002-2003 season, the Pistons have reached at least the conference finals every year. Only the San Antonio Spurs have enjoyed that type of success reaching four conference finals over that same stretch. How should we look at those Detroit Pistons? While the Spurs have gone to less conference finals, in the more competitive Western Conference, they've managed to take home three championship trophies. The Pistons on the other hand, are just 2-4 in six straight conference finals, and have managed to turn just one of their championship appearances into a title. Has this been a franchise of sheer dominance or circumstance? To dissect the run of the Detroit Pistons the first thing one must look at is coaching. The NBA is a league comprised of the worlds most talented athletes, but without an effective coach, that is all they are. SEE: Kevin Garnett & his playoff woes pre-Doc Rivers defense. When it comes to the Pistons, they've had three different coaches lead them to the conference finals throughout this current six year run. Rick Carlisle, Larry Brown, and Flip Saunders were all able to take Detroit four wins from the finals. Now we can exclude the performance of Carlisle for several reasons; He never had the benefit of coaching a talent as unique as Rasheed Wallce, he also coached an offensively challenged team led by Ben Wallace, and finally the core of Prince, Rip, and Billups had just been formed that same season. The sweep by the veteran Nets, which dispatched them from the playoffs that season, should have been expected and was. Carlisle replacement, Larry Brown, was by far the most efficient Piston coach during these years. In Browns first season with the Pistons, embattled forward, Rasheed Wallace, was dealt to Detroit with 22 games remaining in the season. Just what the doctor ordered for this young team. The remainder of the '03-'04 season was led by the veteran Wallace and guard Chauncey Billups. Brown was able to guide the newly formed Pistons straight to the NBA Finals where they defeated the L.A. Lakers 4-1 and thus ended the Shaq & Kobe dynasty. The Pistons arrived at their banner ceremony wearing championship belts, not rings, belts. The NBA's baddest team would follow up their championship season by taking the San Antonio Spurs to seven games before losing in the finals. They didn't know it then but that'd be their last appearance in the NBA Finals as currently constructed. The departure of the hall of fame coach, Larry Brown, would open room for former Timberwolves coach, Flip Saunders. The thing we learned most from coach Saunders is, when the inmates run the asylum, it's good for no one. Over the next three seasons we watched the Pistons march toward the Eastern Conference finals each season, losing each time and twice to eventual NBA champions. Ben Wallace's defense had left for Chicago after the 2005 season, Larry Brown was coaching or what we thought was coaching the New York Knicks, and Rasheed was back to being well, Rasheed. The most success this Piston team had was under the coach who reigned them in best, Brown was that coach. The next thing I'm pointing to is a more blatant mistake of Detroit. The second selection in the 2003 NBA draft. Coming off their first of six trips to the Eastern Conference Finals, the Pistons had the second overall pick in that summers draft. A draft headlined by the likes of Lebron James, Carmelo Anthony, Chris Bosh and Dwayne Wade. James of course was consensus top pick among everyone in the entire world. But who would be the number two pick? Now I know what your about to say, they hadn't yet acquired Rasheed Wallace, BUT THAT DOESN'T MATTER!!!!!!!! I should tell you that they passed on Anthony, Bosh, and Wade to select Serbian, Darko Milicic. Yea, we didn't know Milicic would be TERRIBLE and we didn't know that Bosh, Wade, and Anthony would all go on to win gold medals in the Olympics. What did we know? We know that Dwayne Wade had been a standout at Marquette and taken his team all the way to the final four, the first time that school had reached that far in the tournament in over twenty years. We know that Chris Bosh played the same position as Darko yet we also knew he was the ACC freshman of the year, former high school player of the year, ACC all-defensive team, and second team all ACC, IN JUST ONE SEASON AT GEORGIA TECH. As for Carmelo, well he was coming off one of the greatest performances by any freshman in college basketball HISTORY! Carmelo had averaged 22 points and ten rebounds a game en route toward a Syracuse national championship that season. He was named NCAA Freshman of the Year, NCAA Tournament MVP, and selected to the second team All-American that same season. But Joe Dumars drafted the unproven, untested, and virtually UNKNOWN Darko Milicic. Any one of those three players could have changed the future of this franchise, it was this selection that Dumars missed on and could have altered everything. Finally, the EAST just got better around Detroit. It was only a matter of time before the Western Conference dominance got a little less intimidating. Fortunately for Detroit, the last 8 seasons hadn't looked as good for the Eastern Conference, now they do. When the Cavaliers selected Lebron James, the writing should have been on the wall. That fatal draft sent Wade to the Heat, an Eastern Conference team, Bosh to the Raptors, an Eastern Conference team, and of course Bron Bron to the Cavs, an Eastern Conference team. A year later phenom Dwight Howard would be taken by the Orlando Magic with their first overall pick, yet again, an Eastern Conference team. After the departure of Larry Brown, newly appointed head coach, Flip Saunders would take Detroit to the conference finals. They first met a Miami team led by star guard Dwayne Wade and center, Shaquille O'Neal. The Pistons season would end at the hands of a guy they passed on just a couple years prior. The Heat acquired the veteran O'Neal, and off they went. The following season the Pistons would be met by James and the Cavs in the conference finals. James had developed into exactly what people claimed he would while the Pistons stood pat with their aging guard play and limited inside presence. Finally, what some could call the straw that broke the camels back, the Celtics went out and traded for all-world forward, Kevin Garnett. The Celtics went on to make quick work of Detroit in 2007 and finally it was more than evident. 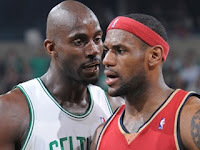 The Celtics had traded for Garnett, the James crew in Cleveland was more than a threat, and the Miami Heat were planning to reload through the draft. The Raptors traded for Jermaine O'Neal to pair with their other young big man, Chris Bosh and the Magic were getting better every season led by center Dwight Howard. The Eastern Conference no longer had two teams that could compete, they had a plethora of teams that could. So here is the Pistons dynasty: 6 Conference Finals, 2 NBA Finals, and 1 Championship Trophy. Guard, Chauncey Billups, has been sent to Denver in exchange for the expiring contract of Allen Iverson. After six straight seasons of championship play while the rest of the conference was on the mat, the Pistons are finally reloading. Who knows what will replace a core that once produced 50-70 win seasons as if they were easy to accomplish. Then again these are the Pistons and they do have one of the most elite scorers of all time in Iverson, paired with Rasheed Wallace in a coming contract year, and the Rip/Prince show is still intact. Six Days Away . . .
That Is How You Fix A Mess!